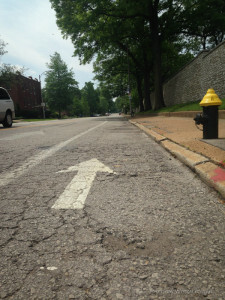 Plastic bollards have been installed on Tower Grove Ave at Magnolia to discourage cars from driving on the bike lanes. We’ve been riding the new bike lanes on Tower Grove Avenue for a couple of months now, and on the whole think they are very well done. 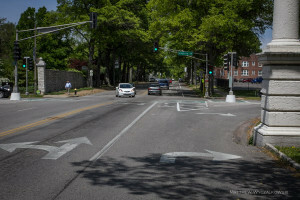 The new segment between Shaw and Magnolia is enjoyable to ride, the intersection at Shaw seems to be working well for all users, and the reconfigured lanes on southbound Tower Grove Ave immediately past Vandeventer do a good job of guiding both drivers and cyclists through a tricky curve. Still, several issues exist which cause problems for cyclists and drivers alike. Bad pavement and fading striping – illustrated below – are predictable issues with straightforward solutions. 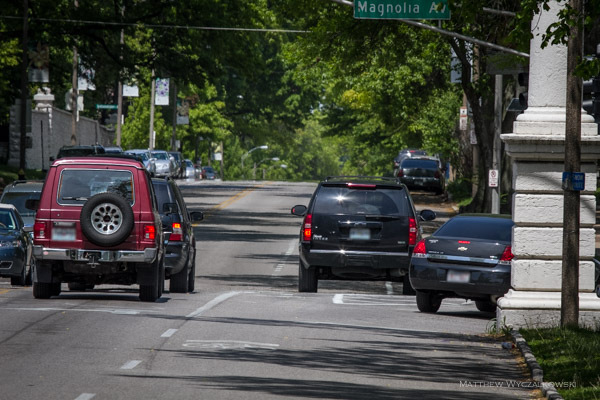 More complicated are new traffic problems on northbound Tower Grove Ave at Magnolia, which we discuss in detail below. Timing to address these matters is critical, as Kingshighway will officially be closing July 6. Faded bike lanes on Tower Grove Ave southbound at Vandeventer intersection. These short lanes give cyclists a clear place to be and guide their crossing through an often busy intersection. The lanes wear quickly, though, and this one is close to disappearing. Regular restriping is necessary to keep the lanes useful. Deteriorating road surface on southbound Tower Grove Ave immediately past of Shaw Blvd. Potholes and gravel make the new bike lanes unappealing and even hazardous in several places, particularly in the stretch south of Shaw. Center Cross Drive in Tower Grove Park is also in very bad shape. 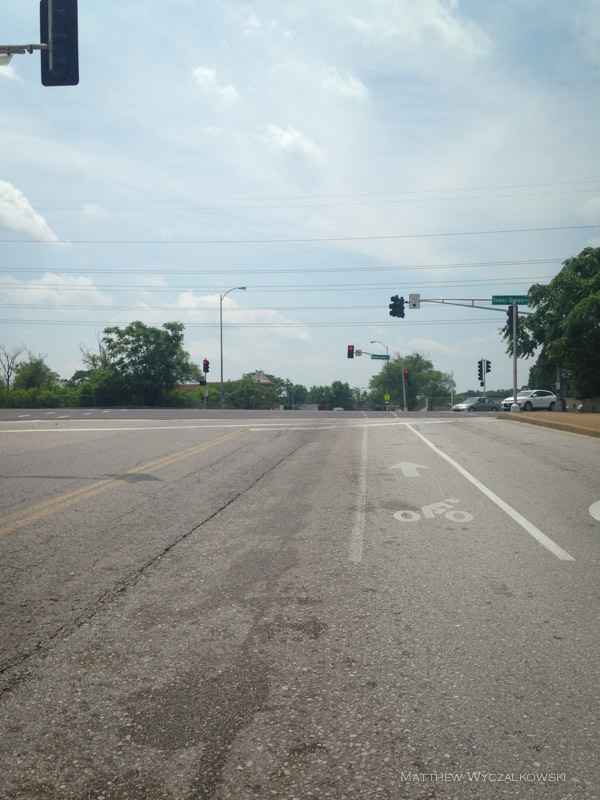 At the southern end of Tower Grove Avenue, the new lane configuration – together with timing of the traffic lights – creates inconvenience and safety concerns for both drivers and cyclists. Northbound Tower Grove Ave exiting Tower Grove Park has a single lane for straight and left-turning traffic, and a separate bike lane with a buffer for cyclists (see below). Tower Grove Avenue looking north from Center Cross Drive toward Magnolia intersection. New bike lane and buffer are visible immediately before intersection. Northbound traffic has a combined left/straight lane as well as a separate right run lane. North- and southbound traffic shares a 40-second-long green light, while west- and eastbound traffic have separate green lights, both about 20 seconds long. Because north- and south-bound traffic shares a green signal, a left-turning car has to wait for southbound traffic to clear before proceeding. Traffic builds up behind this car, and frustrated drivers drive over the bike lane to cross the intersection. In just a few minutes of watching the intersection we saw this many times. Black SUV driving over bike lane to get around left-turning car. An impatient driver (gold car) speeds over bike lanes to pass a left-turning car, nearly colliding moments later with car coming the other direction. Cars driving over bike lanes to pass left-turning traffic are commonplace. Giving northbound traffic its own green would let left-turning traffic flow freely, reduce backups, and give drivers less reason to drive on bike lanes. Plastic bollards would further protect the space for bicycles. The situation as exists causes several problems: first, drivers are inconvenienced and have to choose between waiting an extra cycle at the lights or driving on bike lanes. 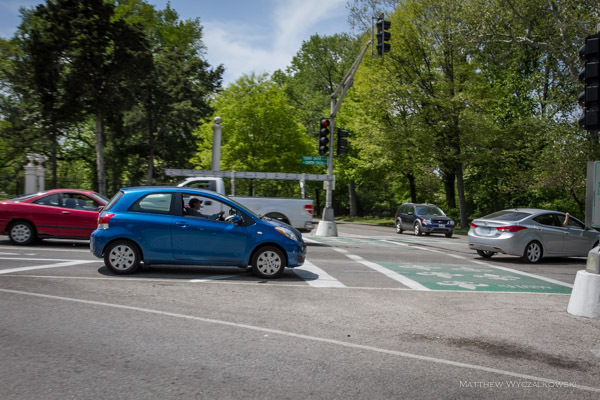 It is also dangerous for drivers: we witnessed a near-accident when a northbound car aggressively pulled around a left-turning car and nearly collided with someone coming the other way. It is dangerous for cyclists for the same reason. Perhaps worst of all, what is happening now encourages driving on bike lanes as a reasonable course of action, and breeds animosity toward bike infrastructure and cyclists. The worry is that the situation will get significantly worse when Kingshighway closes. The city has been aware of some of these issues, and in the last several weeks adjusted the light timing to provide for a longer north/south green. Still, these problems are ongoing, and we believe another approach is needed. Changing traffic light timing might be a solution, by giving northbound and southbound traffic separate green lights. 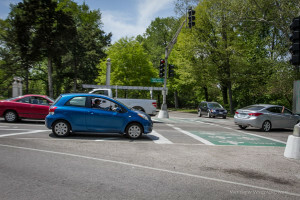 This would allow northbound left-turning cars to proceed without waiting for southbound traffic to clear, reduce backups, and eliminate incentive to drive in the bike lane. Southbound traffic would likewise flow more smoothly with its own green. East- and westbound traffic could share a green light, since traffic there is lighter and there are multiple lanes to pass waiting cars. 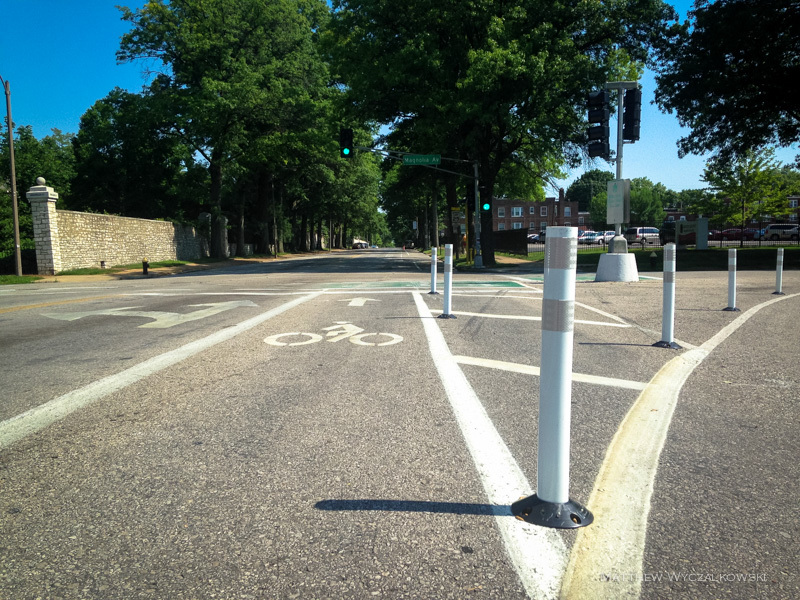 With northbound congestion reduced, placing plastic bollards on the northbound bike lane would protect that space and prevent cars from driving on it. 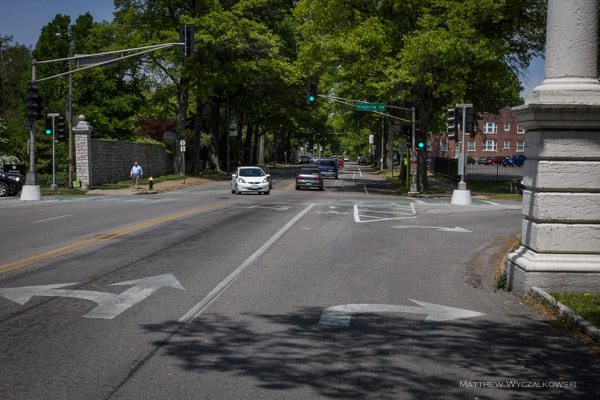 We are grateful to the City for implementing the bike lanes on Tower Grove Avenue before Kingshighway closes, and appreciate their statements of continued commitment to cyclists. It is not unexpected for a project of this size to require tweaks down the road, and these issues are manageable. Still, time is of the essence, and we hope the City will move quickly to address these concerns. 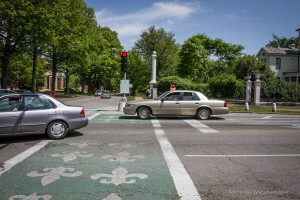 ‹ Save Tower Grove Avenue: We did it! are you serious that you think light timing is going to fix magnolia and tower grove? 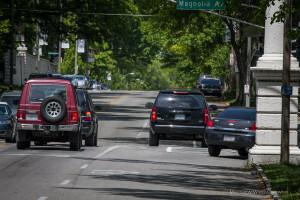 There need to be two SHARED lanes exiting the park and to the immediate north of magnolia up to the drive into the church with MERGE LEFT lane marking in the right lane for non-bikes. But the treatments at vandeventer are absurd. Northbound directs cyclists INTO A SIDEWALK. Southbound is silly in that it moves the lane to the right then the left then the right. Pavement to the right is craptacular and the whole treatment is unpredictable for all road users who weren’t involved in planning.